HomeLinda’s List of Generic Excuses for Awkward Social Moments! Linda’s List of Generic Excuses for Awkward Social Moments! Dear reader we’ve all been there! We’ve all been visitors at the Awkward Moment Hotel. Checking in on our own accord then unable to check out gracefully once the social faux pas has been made. Asking when someone’s baby is due only to find out that not only is the person not pregnant, said person happens to be a man. Inadvertently running over someone’s foot in the parking lot. Making a humorous comment about somebody getting hanged to the person whose loved one just got hanged the day before yesterday! Of course, I haven’t actually done any of these as yet. . . but it’s still early in the day. Therefore, I have taken the liberty of coming up with a few simple excuses –generic, one-size fits all excuses, — if you will — that we can keep up our sleeves should we find the need to smooth over “things” with a friend, a boss or the occasional nun. This should confuse the issue long enough with the longshoreman (or whomever) so that you can run away and take safe haven in the nearest strip joint. This quickly implies to the injured party that 1) you have no control over your feet, and that 2) you are trying to do something about it but haven’t been very successful! And then simply drive off. No muss, no fuss. Now let’s say you go to a gathering and quickly take center stage telling a long, drawn-out, humorous story about somebody being hanged. This little phrase says everything without explaining anything. If uttered along with a tear or two, the hostess will not only remain your friend, she’ll probably be happy to drive you home. So there you have it, Dear Reader, no more awkward moments! Now that you’ve got all the excuses you’ll ever need, get out there and mingle! ← Don’t Know What to Eat? I Know, Let’s Ask the Government! Three cheers for back orders! Woo hoo! And a high five! 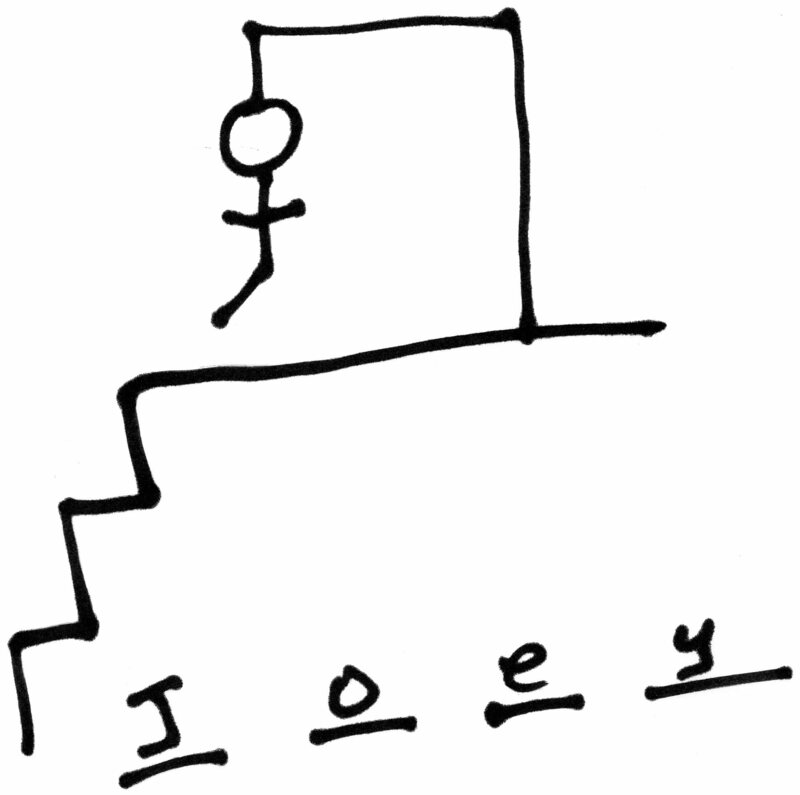 That picture you drew of Joey hanging is making me “LOL” at my desk. I tried to explain to my boss what was so funny only to remember that HER old boss’s husband hanged himself recently. Luckily I was able to use Linda’s generic excuse # 3! No wonder I felt an inner -urgency to get it out to the world!! Haha! No muss, no fuss!!! And I always laugh at a good hanging joke! Seriously, I use the glasses excuse ALL THE TIME. I’m the most self deprecating, excuse making fool, I know. I’m so bad that I’ve taken up residency at the Awkward Moment Hotel. I live there with Mr. Magoo! Hahahahaha! And he’s a great guy to pal around with! You can leave him hanging but he always finds a way to get out of it. I love Mr. Magoo! If only this handy advice had been around when Tyler and I were in high school together and our friend Matt ran over Tyler’s foot in the school parking lot (true story). I’ll bet Tyler wouldn’t have been so mad about it if Matt had simply explained his crutches were on back-order. Awesome advice! Going forward, all my stuff will be on back order! Ha! Well you can be sure the prize is on back order! I suspected as much….and just how my luck has soured today… I’m currently unable to access at least six other WP sites I follow; they’ve been disappeared….the links just create error pages… the gods of WordPress are angry at something we’ve done!…or at me, anyway…. That’s weird. I know I was having trouble with my computer locking up earlier today plus my ipad suddenly broke. And I missing it already and it’s only been broken a couple of hours. Yes, it’s a weird computer day that’s for sure. I wrote to the WP support folks to ask about it… I’m half expecting to have them blame it on the recent huge solar flare, or some such….for four or five hours now, I’ve been unable to get to eight of the blogs I read several times a day, including one I think you know, Jueseppe B., the Obamacrat… five different links to his site got me an error message… I’m a little ticked off…. we are adding this with as a bonus to the Text Lingo Guide – Pocket Edition 2012 – Ginger is on vacation but it’s a command decision and I am in command!! (because Ginger is gone) A must have for everyone! Just think of how less awkward moments will be everywhere. Linda you are a genius bullshitter! I would believe everyone of your excuses…. hahahahhah Love it!!! I consider that the hightest of compliments Lizzie! A command decision! YAY! and to be called a genius bullshitter! Well what can I say, you’ve made my day, month AND year!!! Woooo Hoooooo!!!!!!!!!!!! I am truly thrilled. NO BS! This is much better than my preferred method of staring at the person for a moment before asking “Are you sure?” in a tone that implies I am questioning their intelligence..
Hahahahaha! And something tells me you could pull that off quite successfully too! That and your other trick of getting the person’s mind off what awkward thing you just said by pulling off all your clothers and jumping onto the bar . . . Twinkletoes! Surprisingly,I have not had many awkward conversations in bars.